BATAVIA, Ohio (Aug. 10, 2015) — Ten years ago, Clermont County Sheriff A.J. “Tim” Rodenberg evaluated the County Jail trustee program and decided it could be expanded. 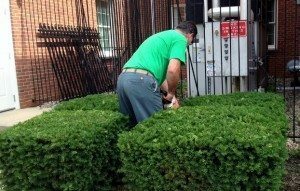 Trustees – jail inmates who were entrusted with performing certain jobs inside the jail and on the grounds – would now be allowed to work outside the jail, in county government buildings and sometimes other public buildings, always under the supervision of a corrections officer or deputy sheriff. “We have more inmates in it now and they’re doing more things,” said Rodenberg. “They’re out more in other county offices, around the buildings, cleaning, doing landscaping, and snow removal. In 2014, Clermont County had 415 inmates in the trustee program. The work they did saved Clermont County, and its taxpayers, approximately $864,000, after accounting for the salaries and benefits of the officers who supervise the crews. No inmates are paid for their work. Trustee programs are not unusual. Many county jails have them. Inmates typically clean and buff floors, work in the laundry, pick up trash, and mow the lawn surrounding the jail. What makes Clermont County’s program different is allowing trustees to work outside the jailhouse perimeter. “Those who are at lowest risk work outside,” said Capt. Bill Hogue, who supervises the program. This summer, for example, trustees helped set up county booths at the County Fair, and also set up tents for the U.S. Rowing Club Nationals at Lake Harsha. You may have spotted the men – they wear green shirts. 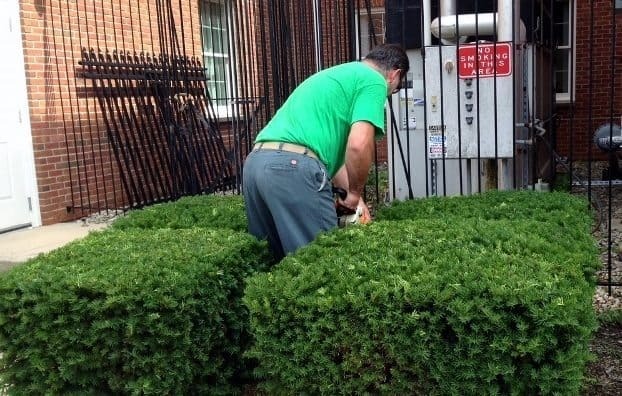 They clean several county buildings and maintain the lawns and shrubs. They have painted, tiled and carpeted. They sometimes work in school buildings during summer, painting and preparing them for the next school year, said Sheriff Rodenberg. At any one time, about 70-75 trustees are in the program, said Hogue. “To be selected, they first must apply because the program is voluntary,” he said. “They are then evaluated on a number of factors, including the offense they were convicted of; their sentence; past criminal history; any history of escape; are they a repeat offender. “We also consider what the corrections officers say about them – they know the inmates best,” Hogue said. The program isn’t just for male inmates; female trustees primarily work inside the jail, in the laundry room, cafeteria, or scanning records for Clermont County. Why would an inmate want to be a trustee? “The biggest reason,” said Sheriff Rodenberg, “is they get time off their sentences. For every day they work, they get two days off their sentence.” It also keeps the inmates busy, and reinforces good work habits. In some cases, inmates even pick up new skills. “I feel like we’re treated more responsibly,” said another woman who was scanning records. “It gives us something to do while we’re here,” said a woman who was putting a food tray together in the cafeteria. Overcrowding has been an issue at the jail, said the sheriff, and this helps address it.